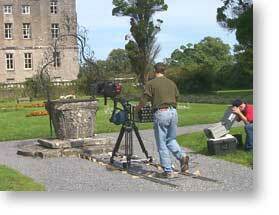 "The Emerald Isle" is the first episode of a 3 one-hour show series shot in the HD 16:9 widescreen format using the new Panasonic AJ-HDC20A DVC PRO HD camera. 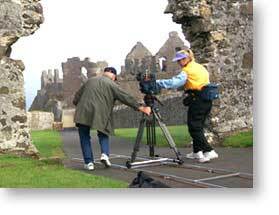 The programs are part of a High Definition Travel Series titled "Discoveries...Ireland", produced by my company Bennett/Watt Entertainment, Inc. for Janson Media. Many times with this kind of shooting our subjects, in this case castles and ruins, are inanimate objects. For this reason, we brought our MICRODOLLY Camera Dolly package. 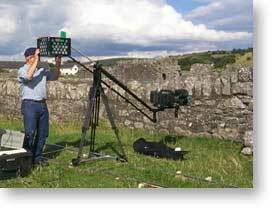 We also had our MICRODOLLY Jib with us and together the Dolly and Jib added a lot to the visual interest of the scenes. At first, we were a bit concerned about shooting in the 16:9 format because of comments we had heard of problems with camera movement and framing in widescreen. Actually, my partner (and wife) Kelly and I found the adjustment to the wider format to be no problem. If anything, camera movement enhances most shots in widescreen. We're shooting in Chile, Argentina, Vietnam, and New Zealand over the next months. Once again, we plan to take the MICRODOLLY Camera Dolly and Jib with us. They're both terrific. The light weight and portability make them perfect for what we're doing. I definitely want to add a few new accessories to our inventory for the upcoming trips.